Marvel’s current comic book crossover event, Secret Wars, has been delayed yet again; the final issue won’t be released for purchase until December. The comic has also been subjected to bloated tie-in comics, confusing story lines, and a build up to the “All New, All Different” universe, which hasn’t been gaining a lot of interest say for a few titles like Black Panther and X-Men 92. And it’s a shame, because this inflated, convoluted, crazy crossover event shares its name with another inflated, convoluted, crazy crossover event. The only difference is the old Secret Wars is a really good comic. Yes, back in 1984 Marvel created an epic crossover event as a way to sell a brand of licensed action figures for Mattel. Mattel was ready to create some awesome new action figures based off some fantastic Marvel superheroes. Marvel had the bright idea of creating an event comic to promote the action figures, and this is where the original Secret Wars came from. So, yeah, comics have been used to promote stuff for a while. Snarky remarks aside, Secret Wars was a massive hit, and began the trend of the annual crossover event. Sure superheroes were teaming up, and there were superhero teams, but this was the first time dozens of heroes and villains came together to battle each other. It sold like hot cakes, and part of that was based off sheer epic scale the book created. Spider-Man, Hulk, The Fantastic Four, The Avengers, The X-Men, and Magneto, are brought to a planet called Battleworld (made of bits and chunks of other planets) by a extra-dimensional being called The Beyonder. The Beyonder also brought a bunch of super villains that include Ultron, The Enchantress, Molecule Man, and the always popular Doctor Doom. The Beyonder demands that these teams of good and evil battle to the death, and whoever is left standing will be granted ultimate power. The stakes are huge, and it’s a blast to read as allegiances change, friendships are tested, and heroism is put through the gauntlet. 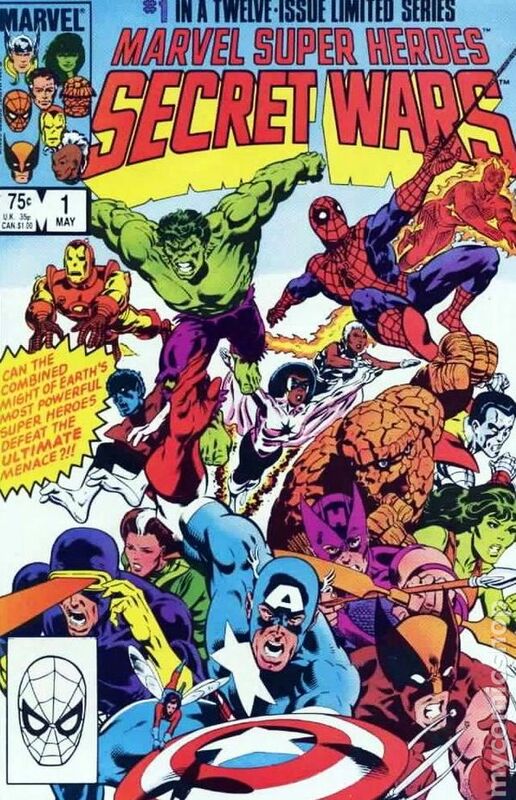 Secret Wars is also where a lot of classic and enduring story lines came from. The Hulk has to save the lives of all the Avengers under, “one hundred and fifty billion tons.” Spider-Man gets his iconic black symbiote suit. 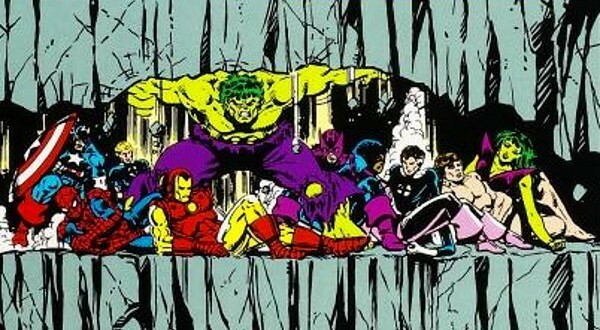 And She-Hulk joins the Fantastic Four. It’s really fun to read, and definitely a great book to pick up that shows how to do a proper crossover event. Now, if we’re being fair, the book is not perfect. Despite the epic scale of the comic, there are a lot of questions that aren’t answered. The first and foremost, there’s never really a reason as to why The Beyonder is doing what he’s doing, or who (or what) he is. Sure they explain it later on, but it feels very odd that we as a reader don’t really know why the heroes and villains are there. Also, there are some bizarre inconsistencies of the comic. For example, The Thing keeps reverting back to Ben Grimm, but it’s never explained why or how. It probably would have been beneficial for more explanation about the rules of Battleworld or the Beyonder’s abilities (again it’s confusing when we don’t know who it is or why it’s doing this). There are other details of the comic too that are confusing, but I’ll spare the lecture, as they are just merely distractions from the story. And after 30 plus years, the story really holds up as a fun adventure epic involving superheroes and villains. The art aged well with a classic comic book feel, the story is a little weird, but definitely entertainingly fun to read, and the huge cast of characters makes the book much more enjoyable. Nick Enquist writes opinion pieces and reviews of comic books, movies, and TV shows for Monkeys Fighting Robots.